The Tivoli Theatre in Wimborne has been purchasing cleaning materials from First Stop Catering & Hygiene Supplies for several years now. Stock levels always seem to be well maintained, as it is rare not to have an order fulfilled when submitted. Quality of the products is high, and prices reasonable. The manager and staff have always been very helpful and friendly. Communication is good. Delivery is free, regular and consistent. We chose First Stop because they are a local company. Matt was very down to earth and not pushy when he came to see us recommending the products he felt would serve us in our industry. 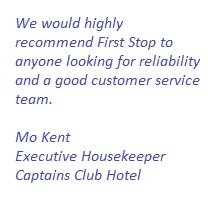 The one thing we like about First Stop is they are a very approachable and friendly. They ensure we get the best price/product available. We would highly recommend First Stop to anyone looking for reliability and a good customer service team. I have been dealing with First Stop for 18 months and I can honestly say the service we receive is excellent. All the staff are so polite and helpful. Alison visits the home once a month, which is very helpful because it gives me a chance to discuss any extra products that we may need. She is also very happy to go the extra mile to get any information on anything we require, which most companies won’t do. We also get a very good service from the telesales girls in the office and the delivery drivers are very polite and co-operative, especially Shaun. I want you to know that I am very pleased with the quality of service your company provides. I sincerely appreciate your responsiveness and the way you conduct business. I have found the products excellent and the help and support from your staff outstanding especially Dave who delivers a first class customer service, nothing being too much trouble. I would recommend your company to others because of my satisfaction with your service. I look forward to doing business with you for years to come. Such a friendly and approachable team at First Stop who all exceed expectations in all they do by providing excellent Customer Service. I would recommend First Stop to all.